The new Apple "Spaceship" campus in Cupertino, now officially known as Apple Park, is nearing completion and warrants some well-deserved recognition. The concept of this campus was first presented to the Cupertino City Council by Steve Jobs in 2006 and again in 2011 when he presented the final design of the project, as you may have seen on YouTube. The new headquarters for one of the world’s largest and most innovative companies sits on a 175-acre site in the center of Silicon Valley, comprised of a circular building of 2.8 million square feet and nearly one mile in circumference. It is clad in the world’s largest panels of curved glass and will house 12,000 employees, with four stories above ground and three stories underground. Employees began working in the building as early as April 2017. This is the world’s largest naturally ventilated building, projected to require no heating or air conditioning for nine months of the year. As one of the most energy-efficient buildings in the world, it is powered completely by renewable energy. This renewable energy is provided by a 17-MW (megawatt) rooftop solar array and a 4-MW Bloom Energy Server® fuel cell. The inner courtyard of the building holds 30 acres of green space covered with fruit trees, a pond, and two miles of walking and running trails. There will be 9,000 trees on the campus, comprised of 309 varieties of indigenous species. An additional 15 acres are planned to be used for a native California grassland. Other features of the campus are a 100,000-square-foot fitness center, the 1,000-seat Steve Jobs Theater for product announcements, parking for 14,200 employees, and a visitor center and café open to the public with an observation deck overlooking the campus. Employees traveling to Apple by bus will board and depart from the subterranean bus station. So, how might this leading-edge, one-of-a-kind, densely populated campus impact the local real estate market? It will most likely have an effect on the surrounding real estate market similar to the one that the Google headquarters campus has had on Mountain View real estate over the past ten years. Per the MLS, median home prices in most Silicon Valley cities peaked in 2007, just prior to the bursting of the housing bubble and the subprime mortgage crisis in 2008. Even though the median home price for Santa Clara County dipped by 36 percent over the course of four years from its peak in 2007, the median home price for Mountain View dipped just 13 percent. The median home price in Mountain View has increased by 100 percent over the past ten years, which includes the Great Recession. 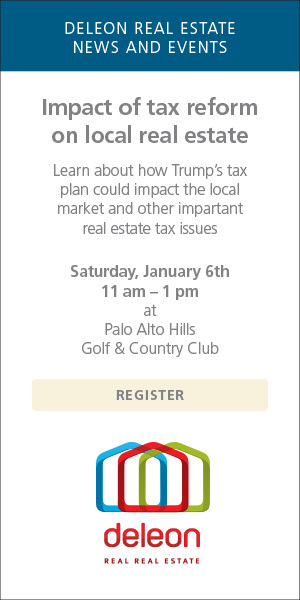 This is very impressive, especially when compared to median home price increases of 85 percent in Palo Alto (the gold standard for Silicon Valley real estate prices and appreciation), 76 percent in Sunnyvale, and 32 percent for all of Santa Clara County. It appears the Sunnyvale housing market has already been appreciating in anticipation of the opening of Apple Park. A key indication of this is that the median home price for Sunnyvale has experienced a greater increase over the past five years than Mountain View, Palo Alto, and all of Santa Clara County. 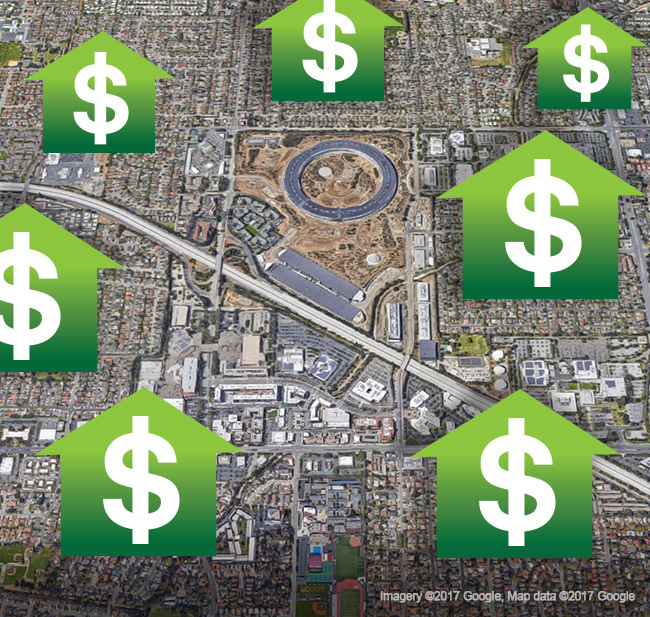 Based on the fact that there will be 12,000 employees working at Apple Park, as well as the fact that many Silicon Valley companies are continuing to grow and hire at a frenetic pace, it is hard to imagine housing prices going anywhere but up. It is a classic supply-and-demand scenario. As the demand continues to increase due to more and more people relocating to Silicon Valley, the limited supply of homes will continue to drive home prices up. DeLeon Realty offers a higher level of service and a greater depth of competency than any other real estate organization in Silicon Valley.